The Comfortably Country Tour, which has one performance at the Hexagon Dive in Pietermaritzburg on June 1, offers a musical journey of modern and traditional country with chart topping country act Parable Fifteen performing original hits such as Trust Me and Helluva Ride as well as country favourites like Johnny Cash's Folsom Prison Blues. 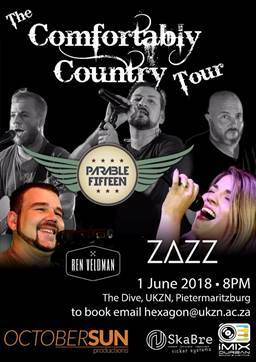 The production features the sultry voice of Zazz, one of South Africa's newest female artists, as well as the soulful bluesy vocals of Ren Veldman. This show promises to leave you begging for an encore! This is a picnic evening so bring food but no drinks, as there is a cash bar.